TEHRAN, Iran (CNN) -- A reporter for Newsweek magazine who was arrested in Tehran has confessed to doing the bidding of Western governments, the semi-official Fars News Agency reported Wednesday. 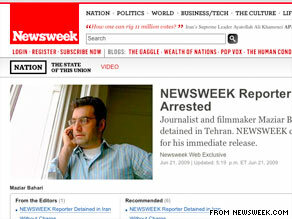 Newsweek says Maziar Bahari has been reporting for years without bias and beyond reproach. Maziar Bahari, 42, made his alleged confession at a news conference Tuesday. Because international journalists have been limited in their ability to gather news in Iran, CNN has not been able to confirm the agency report. Fars reported that the Canadian-Iranian reporter who had worked for the BBC and England's Channel 4 network admitted having filed false reports for Newsweek during the elections -- a charge the magazine rejected. "He has been reporting for years without any possible hint of bias and beyond reproach," Newsweek Paris Bureau Chief Chris Dickey told CNN. "We think he's one of the best reporters in the business." He called the report "preposterous." Dickey said Bahari had not been allowed to speak with a lawyer or with his family since his arrest on June 21. "The Western media are part of the capitalist machinery and liberal democratic governments of the West," Bahari reportedly said. "When a Western reporter comes to Iran, like a politician or specialist, he will be made to fit into the Western complex. For that person, the interests of the Westerners, who take advantage of every occasion to stand against Iran, are of utmost importance." The Fars News Agency account adds that most Western news outlets oppose Iran, but that the Ministry of Information scrutinizes reporters' work, minimizing any harm they might do. Bahari reportedly said Iranian reporters can be tempted by offers of money from Western news organizations to report for them. "Unfortunately, sometimes we fall prey to mistakes, wrong feelings and we become greedy, thus falling into the traps of the foreigners," he said, according to the news agency transcript. "The first step was to propagate the thought of questioning religious authority and maintain that the Islamic Republic of Iran has no popular support and then they said that, under the shadow of such a system, the voting process would be rigged and much hard work went into making this thought a reality in peoples' minds." Hassiba Hadj-Sahraoui of Amnesty International rejected Bahari's alleged confession, calling it part of the Islamic Republic's effort to intimidate the opposition and blame Western powers for the post-election chaos. "We know from people we've talked to that people have been forced to make confessions on TV where they are supposed to have acted on instigation of foreign powers," she said. Indeed, Iran's state-run Press TV has broadcast interviews with people who said they were guilt-ridden protesters who wanted to unburden themselves by confessing that the Western media had made them act as they did. Bahari is not the only reporter said to have confessed, according to Reporters Without Borders, which last week condemned "a parade of Iranian demonstrators being shown on state-run TV confessing to having protested at the behest of foreign media." In a posting on his Web site, former President Mahmoud Khatami accused the government of having restricted communications in the country. "The state-owned media outlet shows the same scenes over and over again, in order to provoke people's feelings," he said. "Where was this media outlet when tens of people were killed and hundreds of people beaten?" He added, "The majority of those arrested are the political activists, journalists and attorneys, who now, unbelievably are pressured, as foreign agents, to falsely confess in television spectacles." Reporters Without Borders said that 28 journalists -- including about 20 who work for a newspaper owned by opposition presidential candidate Mir Hossein Moussavi -- have been arrested since the election. "Arresting an entire editorial staff is totally unprecedented," Reporters Without Borders said. Questioned about the arrest of foreign journalists during demonstrations, the intelligence minister, Mohseni Ejehi, said that "one or two people who came to gather secret information were arrested, but not as journalists. One of them had his equipment confiscated and he is now the subject of an investigation." Reporters are not the only people at risk. Amnesty International said as many as 1,000 people have disappeared since the June 12 election. With his purported confession, Bahari is no longer among them. "We're very happy that they've acknowledged responsibility for holding him," Newsweek's Dickey said. "And we hope very much that they will understand that it is in everybody's interest to release him as soon as possible."